Rate this Article VR has created a growing market for the equipment and devices needed to experience it. These not only includes the VR headsets but the peripherals as well. Let’s take a look at one of the latest peripherals that came out, one designed specifically for your feet. The year 2016 was tagged as the Year of VR as it had brought a lot of development in the fields of both VR and AR technology. Most of it was focused on the optical technology and the software that created the Virtual Reality itself. A stream of headsets or HMD’s came out one after the other creating a competitive environment for both high-end VR like the HTC Vive and the low-end smart phone Google Cardboard like HMD’s. There where a few companies that focused on the development of peripheral VR equipment like controllers, haptic VR gloves and even a VR mask that provided the simulated smell or scent of the VR environment currently being run. It even splashed real water on your face to simulate the VR droplets. 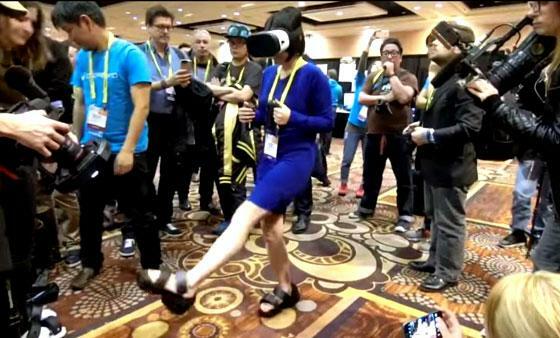 Recently, at CES 2017, another VR peripheral was unveiled that can only be described as VR footwear. Known as the Taclim and currently under development by Japanese gadget-maker Cerevo, the Taclim looks like a pair of oversized electronic sandals that the player slips into to experience haptic feedback on ones feet similar to what you can get from a data glove. The sandals or VR shoes however are a little bit uneven in the fitting department although the soles can separate and slide to allow feet of various sizes and length. The straps are not much help either as testers had a hard time walking much less balancing themselves. The idea itself is a solid one since the players could actually experience the sensation of walking on different virtual surfaces like sand, snow, water and wood. Also, the sandals vibrated whenever the wearer executed a kick in Virtual Reality. This was demonstrated using a yet to be released PlayStation VR game called Headbutt Factory where the player had to kick a series of floating objects. Unfortunately, the sandals failed to vibrate almost half of the time. Although shown to the public, Taclim is still very much in the beta stage where a lot of features still have to be ironed out. Cerevo is developing this VR peripheral in collaboration with Nidec Seimitsu Corporation, one of Japan’s leading companies in the field of haptic components. The sandals use 1.4 inch tactile devices to generate the various VR sensations. Aside from the sandals, Taclim comes with two handheld controllers which they call gloves. The controllers act in a similar way to other VR controllers that are currently on the market. Each controller has a trigger button giving it the action like a gloved hand and contains tactile feedback as well. Cerevo is aiming the product for business use where business owners can put it to good use in advertising or presenting their products and services. An example would be an ice skating rink business that could create a VR simulation app for the Taclim that would let clients experience the feeling of sliding along the ice and set it up in a convention show floor or other public venue. Another possible application would be for arcade game companies that would use the Taclim as part of their VR simulation games for commercial arcades and malls. There are many possibilities where a VR foot simulator can be of good use short of being part of a full VR body suit. However, just like VR itself, VR peripherals are still very much in the infant stages of development. The ideas are sound but the delivery methods need to be worked on, a lot. The idea of using VR footwear in conjunction with headsets like the Vive that uses a limited area where the player can at least walk around may be a good potential market to start with. However, the need for well designed VR footwear would be of great importance as the simulated sensations have to be strong enough to remind the player to keep check on where they are stepping in the virtual world. Taclim is a novel idea that will open up possibilities in the field of haptics. The sandals themselves can be even used for medical purposes as part of patient therapy like in reflexology and therapeutic foot massage. VR apps can be developed to stimulate the user’s feet for various purposes. The Taclim system will be released in open source and will run as a Unity plug-in allowing developers to integrate it into their games or applications. Cerevo will be releasing Taclim this 2017 which will retail at around 1,000.00 to 1,500.00 USD and will probably include Headbutt Factory as well which will also be released on its own for the PlayStation VR by the end of January. The potential of VR footwear may not yet be clearly apparent today but time will tell how far the concept and development started by the Taclim VR System will go.